Mammoth tusks are — mammoth! Woolly mammoths are thought to have finally become extinct about 4,000 years ago but their bones are being recovered in increasing numbers from under the Siberian permafrost. They have been recovered for thousands of years whenever they have been found. But now with the use of aerial surveys and with the high demand for ivory, mammoth ivory is beginning to be recovered in large quantities and used instead of illegal ivory. It is promoted as “ethical” ivory and the prices are high enough for Russian entrepreneurs to expand their digging. National Geographic carries a story about a modern-day Siberian mammoth hunter. The shaggy giants that roamed northern Siberia during the late Pleistocene epoch died off about 10,000 years ago, though isolated populations lingered on islands to the north and east, the last dying out some 3,700 years ago. 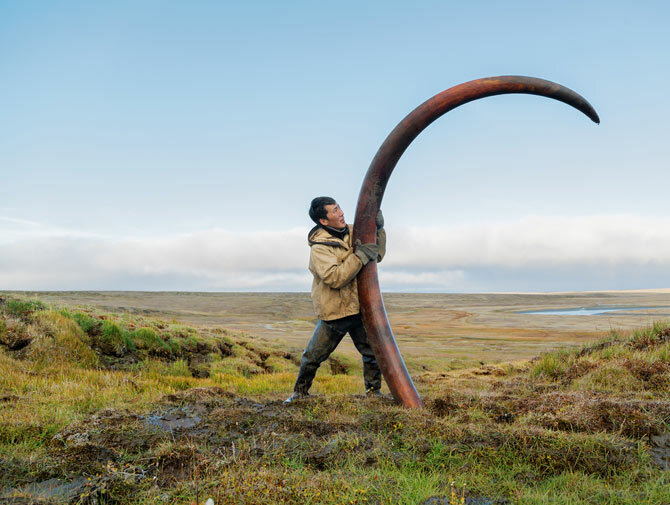 The mammoths’ tusks, which could spiral to more than 13 feet, are reemerging from the permafrost—and fueling a trade that benefits the people of Arctic Siberia, including the native Yakuts, an Asiatic ethnic group that speaks a language of Turkic origin. …..
…. The specimen that emerges is as thick as a tree trunk—150 pounds—and in near-pristine condition. 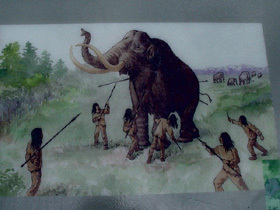 Before hauling the tusk away, Gorokhov tosses a silver earring into the hole he has dug, as an offering to the local spirits. If he gets the ancient relic safely home, it could fetch more than $60,000. Stunning photographs by Evgenia Arbugaeva in National Geographic of mammoth tusks recovered in Arctic Siberia. It is not always easy to imagine quite how big the mammoths were and what would have been involved in hunting them 4,000 years ago. That humans did actually manage to successfully hunt these massive beasts cannot be put down to their stature or their weapons or their prowess with spears and can only have been a result of co-operation and strategy. This entry was posted on March 26, 2013 at 8:05 am and is filed under Business, Development, Evolution, Russia. You can follow any responses to this entry through the RSS 2.0 feed. Both comments and pings are currently closed.